Dennis Light passed away quietly at the Battlefords Union Hospital after a brief illness at the age of 88. Dennis enjoyed his cups of tea and visiting with family and friends until his passing. Dennis was born at home in Spruce Bluff to Ernest and Alice Light. This site became his home and he continued to live there with his beloved pet "Scotty". Dennis attended school at Spruce Bluff, and after the passing of his father, took over the farm. After his years of farming, Dennis rented his land and enjoyed taking part in seeding and harvest from the sidelines. Dennis enjoyed activities like curling, bowling, skiing, the occasional Roughriders and Oilers games, travelling, and woodworking. Dennis loved attending local tradeshows with his treasured wooden boards and clocks. Dennis was predeceased by: his parents, Ernest and Alice Light; his sister, Blanche; and his brother, George. 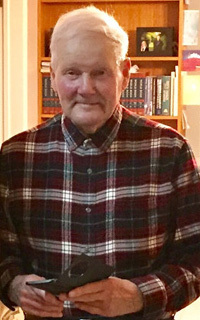 Dennis is remembered by: his sisters, Phyllis McWilliam, Doris Phillips and Patricia (Peter) Schmidt; his cousins, Dot Bolton and Barb Blom; and his many nieces and nephews.